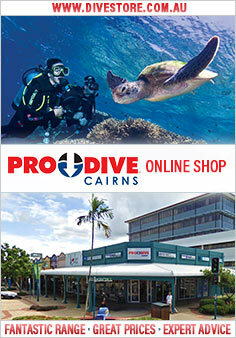 A scenic 30 minute drive northwest of Cairns is Kuranda. Kuranda is the aboriginal for 'village in the rainforest'. 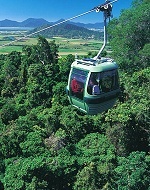 And over the years Kuranda has taken on a distinctive character as a popular visitor destination in its own right. 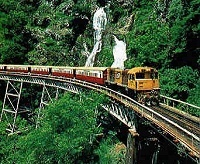 There are three spectacular ways to visit Kuranda, and all are on the Northern Beaches of Cairns - the Kuranda Scenic Railway, which each year takes over half a million people to the village, the multi-award winning Skyrail Rainforest Cableway and the winding Kuranda Range Road which is a photographer's delight with its scenic views. No matter how you arrive at Kuranda each way takes advantage of the coastal and tableland panoramas. On arrival, visitors discover the village of Kuranda's appeal with shady trees that shelter the tranquil main street, old timber church and houses, pubs, shops and galleries. Kuranda also boasts Australia's biggest butterfly display which is home to exotic species such as the brilliant blue Ulysses and the Red Lace Wings butterfly that flash their presence as smaller and camouflaged species feed on the tropical flowers and tress of their expansive sanctuary. A cruise boat and a guided forest walk leave from the banks of the Barron River. Rainforest walks surround the village. There is also a jungle tour on board an amphibious army 'duck'. A short drive from the village is the Barron Falls which cascade down through the Barron Gorge. The falls are a spectacular sight during the summer wet season and are easily viewed from generous sized platforms.